Situated on the highest point of Fira, 500 meters from the center, Kafieris Apartments features views of the sea and the caldera. At the end of the day, guests can relax in the rooftop pool, enjoying the scenic view. Please inform Kafieris Apartments - on the Cliff in advance of your expected arrival time. For this, you can use the special requests section when making the reservation or contact the accommodation directly. The contact details appear on the booking confirmation. 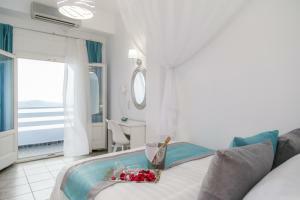 This room is located on the top floor and offers a balcony with panoramic views of the caldera, the sea and the volcano. Accommodations are assigned upon arrival. 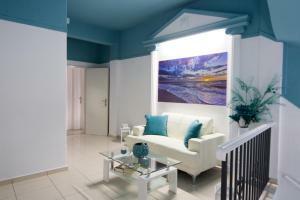 Spacious apartment with a balcony with full or partial sea views. This studio has a toaster, satellite TV and air conditioning. This study does not offer views. This double room has a balcony, be it view and tile / marble floor.